Data centers are more dynamic than ever. The constant change is often a reflection of marketplace behaviors as companies strive to anticipate the emerging requirements of their customers. In the realm of data center Information Technology (IT), innovations that enhance performance often drive investments in data center modernization. As a result, it is not uncommon for data center servers to be refreshed every three years. But server technologies are only part of the equation. On the Operations Technology (OT) side of the data center, physical infrastructure systems such as power, cooling, and ventilation are traditionally refreshed at a much slower rate (sometimes 10 to 20 years for equipment like UPS and CRACS [Computer Room Air Conditioner]). But now that OT system designs are beginning to mirror their IT technology brethren in terms of built-in intelligence, digitized components and connectivity, long periods of inactivity surrounding OT systems modernization present both downtime risks and cost exposures. In fact, outdated physical infrastructure can sometime act as an inhibitor to anticipated IT technology refresh benefits. Increased operational costs – The efficiency of new physical infrastructure equipment is much higher than that of older equipment. Therefore, older technology is often synonymous with higher energy costs. Consider the example of an Uninterruptible Power Supply (UPS). When comparing a modern UPS (at 96% efficiency) bearing the same load profile as a legacy UPS (at 88% efficiency), over a period of 10 years, the cost of losses (i.e., additional energy costs due to inefficiency) is nearly $400K more for the older UPS. In fact, some of the newest UPSs, when operating in eco-mode, can attain efficiencies of up to 99%. The same holds true for cooling technologies, which traditionally consume more power than the power systems. Newer cooling systems, equipped with variable speed drives, consume much less energy and thereby reduce CO2 emissions. Lower systems reliability – When determining system reliability, it is important to not confuse the reliability of individual power components with the reliability of the power system as a whole. Overall system reliability is only as strong as its weakest link. In situations where data center physical infrastructure has not been modernized in 8-12 years, the weak links are many and the question is not if failure will occur, but when. Older physical infrastructure equipment takes more time, effort and expense to support. Spare parts, for example, cost more as parts inventories dwindle over time. The mean time to repair (MTTR) increases as it becomes more difficult to locate and secure technicians that are knowledgeable enough to repair the old equipment. On the cooling side, new innovative system designs require less floor space and service access is often much simpler, which also reduces time to repair. Limits to data center agility – In today’s data centers, the term agility implies the deployment of data center assets in innovative ways that permit data center operation at the speed of business. The marketplace changes quickly, and therefore the data center also needs to react quickly. An outdated physical infrastructure can limit that agility. Installing state-of-the-art IT equipment in an aging facility can limit the benefits that can be delivered by the new technology. In some cases, the new IT technology will overload the older infrastructure to the point of failure. If an existing UPS fails to meet the organization’s present or future mission critical performance requirements (e.g., supporting the entire IT load at the required redundancy and runtime levels), then it is at “end of life”. Newer technologies, such as modular, scalable infrastructure and mobile pre-fab infrastructures are key enablers for agility as they support rapid business volume expansion. Modern data center physical infrastructure systems now provide operators with warning signs that systems are aging. Rather than discovering a problem only when a UPS system fails, for instance, new remote monitoring services provide data on AC capacitor life, battery service life, DC capacitor life, fan life, supply service life, parts wear (power block, contactors, breakers), power module life, air filter life, and warranty expiration. 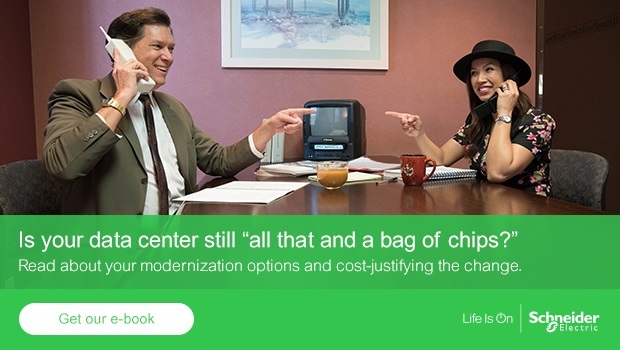 To learn more about data center modernization best practices, download the new Schneider Electric e-guide entitled “Modernize or Outsource: Evaluating the Options for your Data Center”.